Gross National Happiness may have put the pristine Himalayan kingdom of Bhutan on the world map. But to get the most out of this true highlander nation means trekking. Some treks are epic once-in-a-lifetime adventures that take a week or more. But Erin Levi, who has made many Bhutan treks, shares four more accessible day-long rambles that access the best of Bhutanese culture, wildlife and beauty. You cross over a fast-flowing river, walk under guava trees and alongside verdant rice fields. 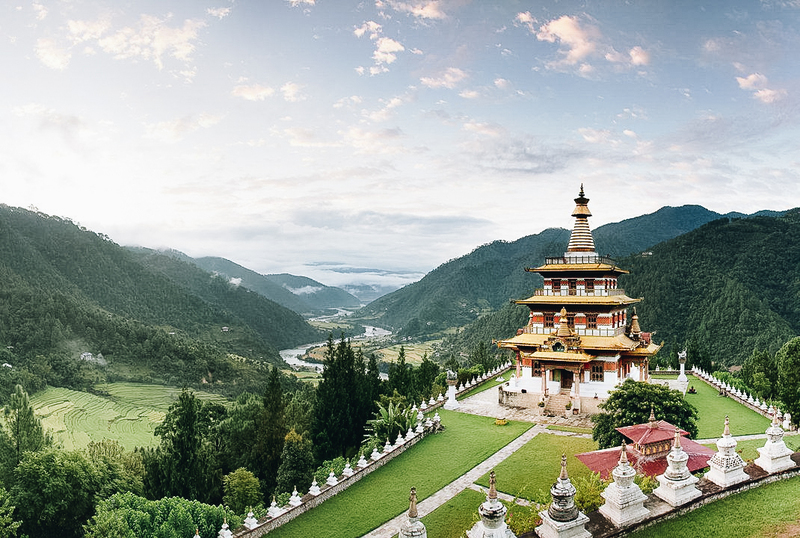 After one day driving along Bhutan’s East-West lateral highway across the rugged, tree-blanketed terrain of mountains and glacial and subtropical lakes, you’ll see Bhutan isn’t just the “happiest country in the world.” But a trekking destination to rival Nepal’s. Trekking is the ideal way to enjoy Bhutan, offering natural encounters with locals, close-up glimpses of endangered flora and fauna, and fragrant mountain air in untouched landscapes – without the crowds (the daily minimum tariff of US$200 to US$250 keep the numbers down). There are treks for about everyone’s ability and interests. Timed right, the 15-day Laya Gasa Trek meets up with the relatively new Royal Highlander Festival, organized by the king himself. In the country’s “Wild East,” the seven-day Merak Sakteng Trek passes through spectacular rhododendron forests and Brokpa villages home to semi-nomadic yak herders. Or for a bigger challenge, the month-long Snowman Trek – crossing 13 mountain passes – is considered the world’s most difficult trek. But you don’t have to commit that much time (or muscle exertion) to experience the best of Bhutan. Here are four of my favorite day-long Himalaya rambles, easily tacked onto any Bhutan trip, that access gorgeous valley trails and breathtaking climbs to sacred Buddhist sites. 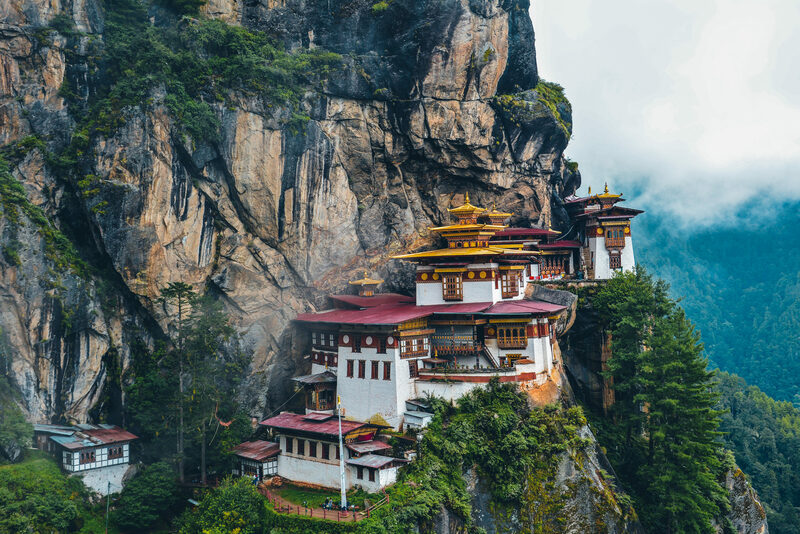 No trip to Bhutan would be complete without hiking to the Tiger’s Nest Monastery, or Taktsang, in Paro, the point of entry and exit in Bhutan if you’re flying in. It is, after all, the spiritual crown jewel of the kingdom. Clinging to a cliff at 10,240 feet above sea level, the vertigo-inducing, impenetrable temple complex was originally built in the 17th century on the site of a cave that Guru Rinpoche, an 8th-century Buddhist master, had reached by flying on the back of a tigress, and where he meditated for three years, three months, and three days to clear the area of demons. Given that it’s a 3,000-foot ascent from the starting point, it’s best to wait till the end of your trip to embark on the half-day trek (about five or six hours return) so that you’ve had ample time to adjust to the altitude. Insider tip: ask your guide to schedule a traditional hot stone bath that evening. Your muscles will thank you, and it’s the perfect way to bid farewell to Bhutan—and ruminate over your return. The hike begins at 8,500 feet above sea level in the valley west of Paro Town and winds gradually along a beautiful river through an enchanting forest, taking you over wooden footbridges, past a large stupa and across a prayer flag-decorated suspension bridge to the start of a short and steep ascent up a hill to 10,167 feet, where you’ll reach the temple. To get the goddess’ blessings, a monk will take you to the gilded statue of her, which has been decorated with prayer beads and prayer shawls, making it difficult to see if she’s really floating. While my guide had told me that if I was skeptical, I shouldn’t enter the temple, the monk, without me saying a word, turned on his flashlight and slid a bill under her feet, as if he knew I needed convincing. This easy, one-hour hike to Khamsum Yuelley Namgyel, near the famed Chimi Llakhang fertility temple – takes you across a suspension bridge over the fast-flowing Mo Chhu (river), under guava trees and alongside verdant rice fields – where you’ll likely observe Bhutanese farmers working – before reaching a big, brightly-colored prayer wheel. There, you can buy whatever fruit or veggie that’s in season (eg guavas or chilies). If you’re lucky, you’ll meet a toothless nonagenarian who has stories about working for the first two kings (there are five in total)—though you’ll need your guide to help translate. Continue along the short path up the hill till you reach your destination: Khamsum Yuelley Namgyel, a contemporary-styled, gold-topped four-storey stupa built in 2004 by the Queen Mother for her son before he became the Fifth King, and which has expansive views of the lush river valley beyond and the white pagoda-dotted property below. A highlight of the remote district of Haa, the nine-hour Meri Puensum Nature Trail is one of Bhutan’s most challenging one-day hikes. It crosses three small mountains (called “three brothers”) that are believed to be the embodiment of the Buddha (past, present and future). The mountains are so sacred locals believe there’s no need for a temple to be built on them – ie, no demonic forces to quell here. 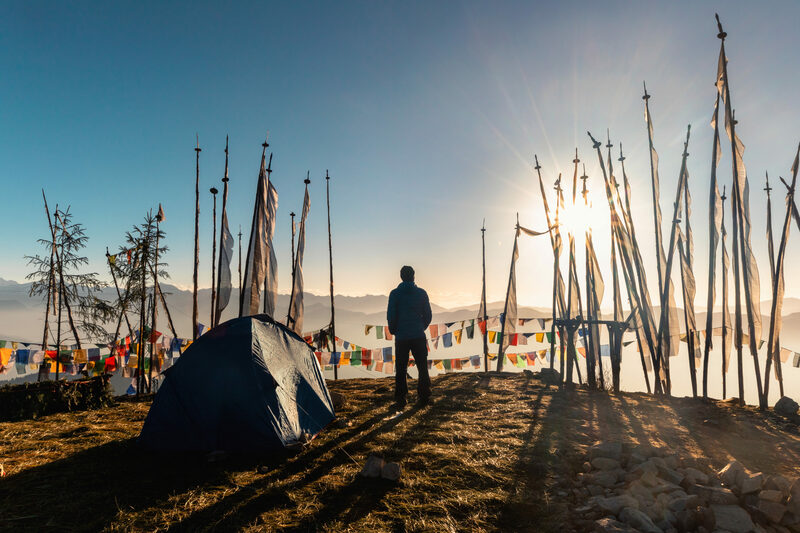 The three-peak trek is certainly tough, but is considered a religious experience for locals, which is why you’ll see Bhutanese wearing their finest ghos and kiras. Some visitors circumambulate the base of the mountains, but many guides zigzag up the peaks more directly, commencing with a grueling three-hour ascent. Expect sore knees, but also rewarding views as you cross summit to summit to summit, overlooking a magical hidden valley nearby. Erin Levi is a travel writer who’s regularly written for The New York Times. Magical Bhutan is a world like no other. We’ll trek Himalayan peaks and be among the very few Westerners to experience the king’s own Royal Highlander festival. It’s the perfect blend of culture and adventure on a one-of-a-kind trek to the rooftop of the world.